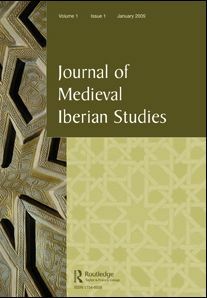 The Journal of Medieval Iberian Studies, an interdisciplinary journal (published by Taylor and Francis) for innovative scholarship on the Christian, Jewish, and Islamic cultures of the Iberian Peninsula from the fifth to the sixteenth centuries, welcomes new submissions. Full details, and tables of contents, may be found here; articles must be submitted through the ScholarOne online system. JMIS is available to AARHMS members for a discounted rate. Please write to simon.r.doubleday@hofstra.edu for further information. JMIS encompasses archaeology, art and architectures, music, philosophy, and religious studies, as well as history, codicology, manuscript studies, and the multiple Arabic, Lain, Romance and Hebrew linguistic and literary traditions of Iberia. Essays that engage with multi-disciplinary perspectives, non-traditional submissions (including multimedia or theoretically attuned work), and comparative articles addressing the significance for medieval Iberian studies of broader developments in medieval European, colonial Latin American, Peninsular, or North African studies (and vice-versa) are strongly encouraged.